If you're a fan of the Studio Ghibli animation movies, you might want to visit some of the places that have inspired the settings for these works. 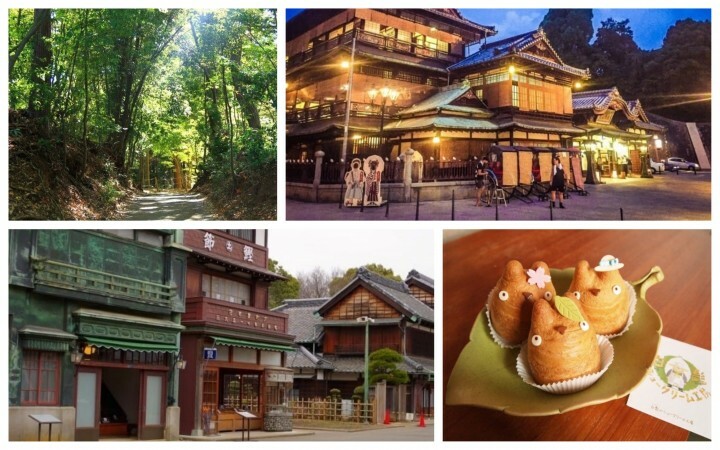 This article introduces 15 places around Japan that are related to Studio Ghibli’s movies. From 7 Things To Enjoy In Kushiro, Hokkaido: Canoeing, Sunsets And More! Kushiro in Hokkaido has been said to be the inspiration for the setting of "When Marnie Was There". This is one of Ghibli's newer movies which wasn't directed by Hayao Miyazaki. Most Ghibli fans are mainly interested in Miyazaki's movies, so this might not be the first place they would want to visit for a Ghibli sightseeing. However, Kushiro is a great place to visit even if it's not for the movie. It has one of the three biggest marketplaces in Hokkaido and some great views! Aside from this, you can get some of the best seafood in Hokkaido here. 7 Things To Enjoy In Kushiro, Hokkaido: Canoeing, Sunsets And More! Hirakawa in Aomori is home to Seibien, a western style house with a Japanese garden that is featured in the movie "The Secret World of Arrietty". The garden belonging to the house is one of the three greatest gardens created in the Meiji era (1868 - 1912). It is even deemed a nationally designated place of scenic beauty and a popular sightseeing spot. Aside from Seibien, Hirakawa is also home Hirosaki Castle and the Josenji Temple, a temple where a Buddhist priest brews and serves your coffee. The harbor town of Tomonoura has been confirmed to have been the inspiration for the imagery of "Ponyo". You will be able to find many places and buildings that will remind you of "Ponyo" everywhere. The town is very proud to have been the inspiration for Miyazaki's art and you will find little Ponyo's all around. Tomonoura has been the setting for many TV shows and movies over the years, not only "Ponyo". The town is very old and you will find many interesting places to explore. The Ota House in Tomonoura, for example, has originated the brewing technique for Homeishu, a traditional liquor made with 16 different spices. Dogo Onsen in Ehime seems to be the best known when it comes to onsen resorts that served as inspiration for "Spirited Away". Some people claim that it is the only onsen that inspired Aburaya even though Miyazaki himself says otherwise. Other than the two other hot spring resorts, the whole onsen town of Dogo has supposedly served as inspiration for the movie. The main building certainly looks like a possible model but it is missing the iconic red bridge. Dogo Onsen has a history stretching back over 1000 years, making it one of the oldest hot spring resorts in Japan. It is easy to see how such an old onsen can serve as setting for a ghost story. Yakushima is one of the Osumi islands in Kagoshima. It's mystic forest served as main inspiration for Miyazaki's masterpiece "Princess Mononoke". If you get deep enough into the forest you truly step into Mononoke's World. Walkways covered in moss, rivers carving their way through the greenery, huge trees towering over you as if they want to protect you from the world... Nothing but peace and nature. Can you hear the forest spirits? Can you see them running past you? This is truly a scenery worthy of forest gods. Trekking In Yakushima - Explore The Course Virtually! From Donguri Republic: Find Charming Studio Ghibli Character-Themed Goods! Donguri Republic ("Acorn Republic" in English) is the official Ghibli goods shop. Here you can find merchandise from all of Studio Ghibli's movies. You can find almost everything your heart desires in a Ghibli movie design. From keychains and stationery to towels, toilet covers, rugs, flower pots and even miniature Ghibli characters, you will most surely find an item that you'd like to use in your home. The shop really captures the magical world of Ghibli and it's a great pleasure to just browse around. The goods sold here are ideal as souvenirs and also make great gifts for your friends and family. Many of the items are limited edition and most of them are only available in Japan. You can find Donguri Republic shops in most of the major cities all over Japan. Donguri Republic: Find Charming Studio Ghibli Character-Themed Goods! Step Into Ghibli's World Wherever You Are! Studio Ghibli offers a magical world inspired by places all over Japan. You can find Hayao Miyazaki's art nearly everywhere if you just look closely. No matter if it's a small Totoro in your neighbor's flower pot or the big Ghibli Clock in Shiodome, Ghibli's world is all around us. How about searching for it yourself? The Ghibli Clock In Shiodome - Enjoy Hayao Miyazaki’s Art For Free! The Ghibli Museum In Mitaka - Welcome To The World Of Ghibli! Get Pokémon, Sanrio and Ghibli Souvenirs from Tokyo Station's Character Street!